Note: image is brother and D.V. Leistungssieger Flax vom Kirchbühl. Cliff vom Kirchbühl : SchH 3 and passed the Körung with Körklasse 1A rating. 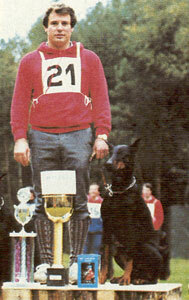 He sire of the von Hochstede “A, C” litters (Armin, Conny, Cora). Cora vom Kirchbühl: SchH 3 and dam of the vom Kirchbühl “I, K, M” litters (Ilo, Kuno, Kustos, Muse). Flax vom Kirchbühl: SchH 3 and D.V. Leistungssieger in 1980. Esta's sire, Falk vom Rotbachtal, was used extensively as a stud dog and passed the Körung 'for life' with highest rating for hardness and working drives while her maternal grand-dam, Palma von Ellendonk, was the D.V. Leistungssiegerin in 1975 and passed the Körung 'for life' with highest rating for hardness and working drives. Beatrix: SchH 1 and dam of the vom Steinbachtal "B" litter (Britta). Bianca: SchH 3, FH, DV-DM participant and dam of the vom Hause Ehrlich "E, K" litters (Erwin, Emmely, Eve).